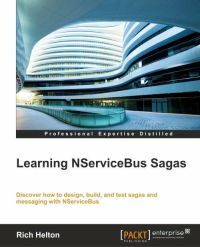 After I published the review for Learning NServiceBus - Second Edition, I got contacted by a Packt Publishing representative, whether I'd like to review another book about NServiceBus, they have recently released: Learning NServiceBus Sagas by Rich Helton. Seeing it as a logical continuation of the book I have already read, I agreed to do it. In spite of the introductory chapter, the reader should already be familiar in advance with the concepts of an enterprise service bus and the patterns related to it, as well as with the basics of NServiceBus. Also the book is not focused only on sagas at all; it gets distracted by many other technologies, such ASP.NET MVC, WCF, Microsoft Azure and others, not really telling much about any of them either. The samples are very contrived and almost impossible to make sense of by just reading the book, because their crucial parts are not explained and can only be found in the accompanying download file. Not even the basic functionality and structure of sagas is properly explained, much less any advanced concepts and usage scenarios. On the other hand; just to prove how simple it is to change the transport from MSMQ to other queuing technologies, the process is described 5 times in different parts of the book, making NServiceBus use RabbitMQ, ActiveMQ (twice), Azure Storage Queues and Azure Service Bus, instead. The content is not well structured; the author keeps jumping from one topic to the other, often repeating himself, which makes the book very difficult to follow. On top of that, the text is occasionally even misguiding; e.g. unit testing (much less TDD) is not about initially writing the code in a test and then copying it to its correct location. I can't really recommend the book to anyone. It's just a waste of time and money. You'll learn more by reading the official documentation and blog posts on the topic.